I've been sitting on a bit of news all week, taking it in, letting it roam around in my heart and allowing increasing doses of joy to season my thoughts. You see Mr E and I had come to a place of accepting that due to our ages (we are in our 50's) a bank would be unwilling to give us a housing loan, but just to be sure we made an appointment to have a face to face chat and see if there was indeed a glimmer of hope before we laid the dream aside for good. We've never bought a house before so we're unusual 'first home buyers' but not unheard of. Imagine our surprise when we were told that if we can save a certain amount for a deposit (based on the home loan amount we will be able to borrow) and we do this in the not too distant future (because age is indeed an issue the more time passes) then we can build or purchase a dwelling to make our very own. 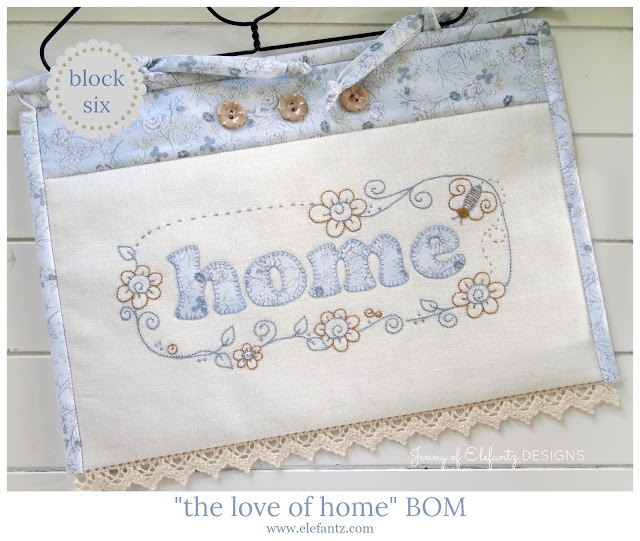 It was that hope 're-ignited' which inspired me to share this particular design with you as the next block in our "The Love of Home" BOM. It's not a new pattern, initially appearing in a 2015 issue of The Stitchery Club, but it has remained one of my favourite designs and this week I finally took the stitchery and created a little quilt to hang in my 'one day' new home, God willing. In order to make our dream come true we must tighten our belts and budget wisely for the rest of this year, trusting the Lord to guide us. You know this means lots more home cooking and thrifting, and my oh my, how happy that makes me! I want to shout for joy every day, but another part of me is very calm and ready to work hard beside my husband month by month until we have what we need to take the next step. As Mr E said, "First priority save the deposit, then we'll open the next door and walk through." Joy, calm resolve, hard work...what a wonderful recipe. If you'd like to stitch this month's block you can download the free pattern HERE in my shop. 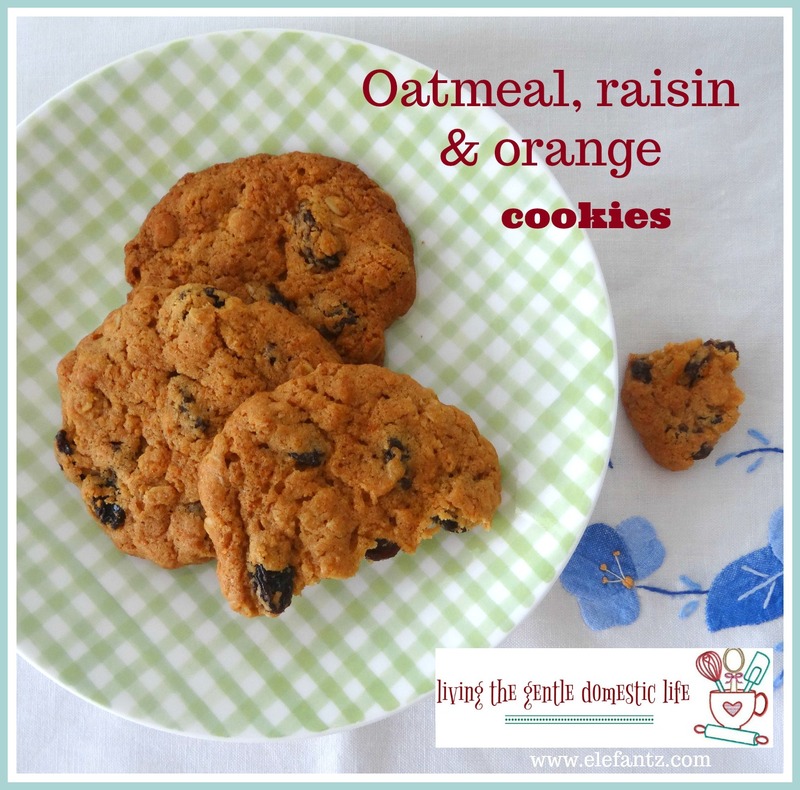 And speaking of recipes, a few ladies asked if I'd share the one for those Oatmeal, Raisin and Orange cookies I baked earlier this week for Mr E.
Not a problem, in fact you can have the recipe and as an extra treat I've included a simple little 'cookies with tea' stitchery too, so you can prepare fabric and threads while the cookies bake. Download the recipe with bonus stitchery pattern HERE. I'm taking the next week off from blogging to make the most of Mr E's final week of school holidays. It looks like we won't get away after all so while he continues with car repairs, garden pots and outside chores I'll bake and sew and plan some new projects for around the house. Most everything I make these days has a purpose and that reminds me of my Nana, who enjoyed the fruits of her labour by choosing to make or bake for a reason, always with a smile, a song and a whistle. I do tend to be a little more frivolous than she was and that's okay because I am me, but the lessons and examples she poured into my life are bearing good fruit - more with each passing year. My daughters, Aisha and Blossom, would like me to embroider them a cardie each so that could well be my hand sewing at night next week (I'm trying a different technique than the one earlier this week, but more about that another time) and I still have a knitted bear for Cully May to complete, as well as a quilt 'in progress' and recipes to print and store in a new covered binder...but that's life. A good and useful life by my reckoning. May the coming days overflow with goodness and grace in your life too. That news is so very splendid. I lost my home in my divorce. I don't think I will ever own another place and a single person. But I am content with that. My joy for you is stupendous. I also love the stitchery. Such wonderful news. Your homes are always yours despite not owning them. The homey touches you design and create put your mark on the house. However, it must be frustrating being restricted from ganging things on walls etc. I love the BOM and particularly like the colours you have chosen . I may just use the same colourways with this one. Enjoy your break. Love the embroidery on the cardigan, makes it more personal. Oh boy! It is always easier to achieve something when you have a definite goal. Good luck on reaching it. Your stitchery is lovely. Just imagine it in your new home. Oooooh! So exciting! It's such fun to have a plan, a goal in mind. It will be fun making things and dreaming of where they might go in the new house! Big feelings of happiness and joy! Beautiful embroidery! Good luck on your dreams! Excellently good and useful life! Thank you for sharing that recipe. I do like anything with orange in it, so next time it's cool enough to have the oven on, I will try these. Might put a few cranberries in, too. 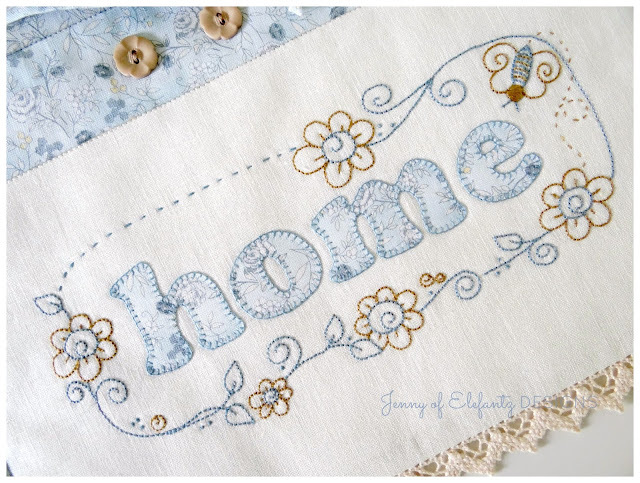 You know I'm excited about your house plans and praying for the perfect place for you to call home and hang this adorable stitchery. Thanks for all you do for all of us. Jenny, what exciting happy news! Thank you for the recipe, especially for the directions in American measurements. Oh, what an exciting goal to save for. 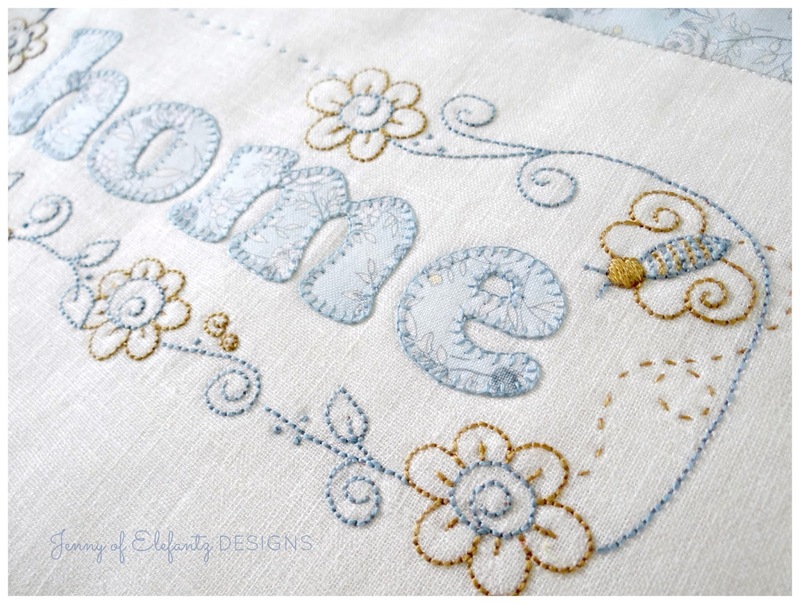 Home is such an evocative word and beautifully presented in your sweet stitchery. Hope all your dreams come true. We just moved into a tiny little place my husband built for us. It took 12 years of doing what we could with how much money we had. We finally moved into it last year. We did own a home before and had been in it for 32 years. But, we are in our 50-60's as well and being out of debt was important because my husbands job was so iffy. We sold the family home and moved into our tiny little cottage. It all went so smoothly and quickly that I knew Gods hand was in it. I am so loving my little home. I am in the process of sorting, donating and selling off stuff. Keeping only things I love and use. Happy for you. God knows your hearts desire and your love of "home." The perfect one is waiting. Congratulations on the news about buying a house!!!!! I love Mr. E's advice...perfect! Enjoy your week with Mr. E, refresh yourself and take lots of pictures to share when you get back here!!! So happy for you, Jenny. You are proving the truth of Psalm 37:4 "Delight yourself in the Lord and He will give you the desires of your heart." Many blessings to you. Hi Jenny thats wonderful news about a house loan,i wish you both the very best,love your home project its very cute. I have been a homeowner for many years but have not forgotten the work and sacrifice that went into saving for the downpayment. As I read about your dream of home ownership, Jenny, I realized there was a small but concrete way I could both help you reach your goal and express my thanks for all you have so generously offered to your readers. I have not joined the stitchery club or purchased any individual patterns recently because I am trying to be realistic about what I can accomplish. This has been especially true since I "retired" last year to care for my now 14-month-old granddaughter while her mama works. Today, however, I bought one pattern to help you get just a tiny bit closer to to realizing your dream. After a lot of looking I settled on "Pink and Green Pretties". I understand you probably make very little profit from the sale of one pattern, but I am hoping others will read this comment and purchase a pattern or two. Blessings to you and Mr. E. in this endeavor. I will keep you and Mr. E. In my prayers that you will get your house. Thank you for the lovely pattern. That is great news on the house front Jenny, our son and daughter-in-law have just got the keys to their first home this week so they are embarking upon a similar journey. Best wishes to you and yours. Love that Home pattern, my favourite colour. You do so much work I don't know how you manage it! Oh Jenny I am in (happy) tears about your home news. Its long been a dream of mine as well that I'm sure won't come true, but I'm so,so very happy for you and Mr. E.
Congratulations to you both, and if there were anyway in the world I could do so I'd send you as a gift the deposit you need toward the loan. However being financially challenged, (also known as poor lol) I send you both best wishes and true belief that you will attain this dream and true confidence that you both deserve this and more. Best wishes and thanks for all you bless us with. I am praying for you and Mr. E as you work to make your dream come true. You are one of the most "homemaking" souls ever and I know you will love to have your own home with no restrictions as to what you can do or how you can decorate. Thanks for another free pattern. You are so generous, dear Jenny! You know I'm praying HARD for this dream to come to pass - I think for as long as I've known you I've been praying for it! May God grant you the desire of your heart! Lovely design sweetheart, thank you, and I'm looking forward to seeing the other techniques you use on the cardigans! I wish you the best with the house, my friend. And what a lovely home design! Thank You very much for your patterns. I will keep you in my prayers for your dream home, I know how happy it has made me having that security and hope that you can get there soon as well. Thank you so much for the patterns and the recipes, you are a very generous soul. I have been behind on my blog reading but am now starting to catch up and I am very happy to hear the wonderful news that you may soon be able to buy your first home. I have often thought that it was too bad that the rentals you were in restricted your being able to hang many of your beautiful creations. Now you will have a place that you will be able to decorate in your own special way. I am thrilled that you and Mr. E are going to be "first time home buyers." I know you are elated and perhaps "over the moon" with excitement. I'd be untruthful if I were to say I'm surprised. 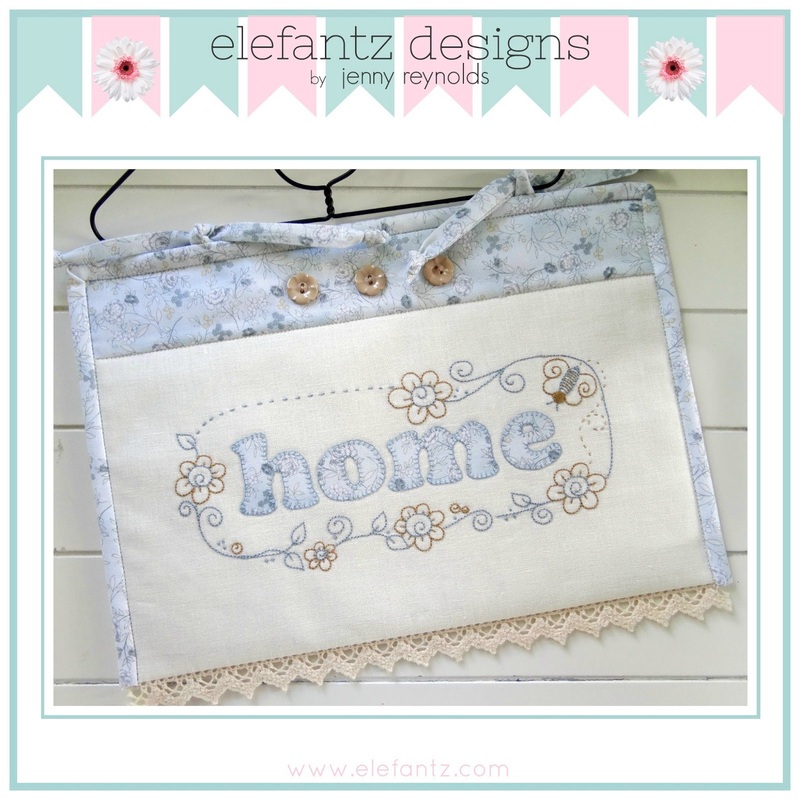 You have planted an abundance of seed for your home with the generosity of free patterns. I know of some patterns that are not of the caliber of your patterns and the designers continually charge and exorbitant price for the pattern. I believe you are being rewarded for your willingness to share your time and talent with others. I'm sure that others will take your patterns and make things for others so that the impact from your time and talent is multiplied many times over. Blessings on your new home. Jenny, Let me encourage you both in your endeavor for "first time home buyer" at this stage of your lives. In 2008 I was a first time buyer at the age of 58 and the used home I bought was 2 years older than me. LOL It wasn't perfect, but I could see the possibilities. It met my budget and just the right size for me. A small cottage home. So I am here to tell you it is never too late for your dream. You will get there little by little. The Lord's Blessings are new every morning.